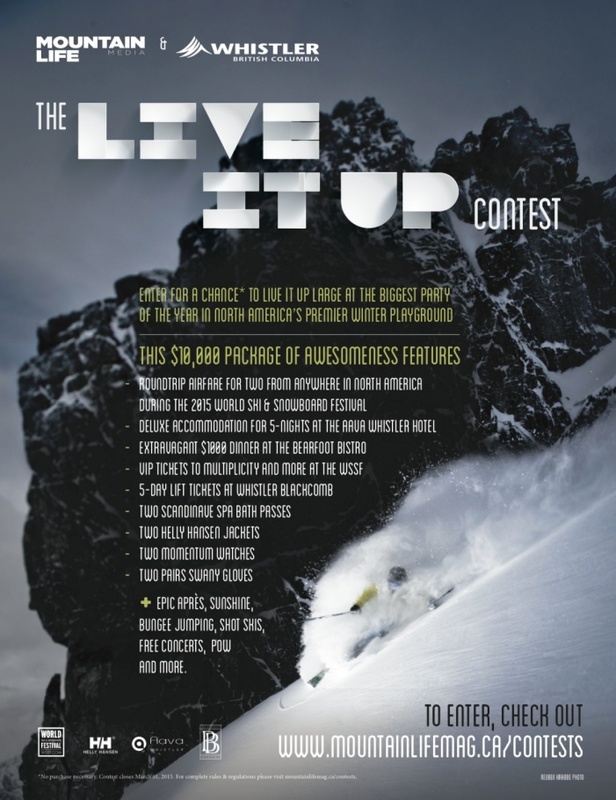 Mountain Life Media and Tourism Whistler’s Live It Up contest just might be the best giveaway on earth. Case in point: the prize package is worth $10,000, which includes a five-day trip for two (airfare included) to experience the best of the best of Whistler, during the 2015 World Ski and Snowboard Festival. Take a look at the list of prizes – it should be clear why Live It Up is the best contest ever. But just to be sure, here are five more reasons. You get the VIP experience at the World Ski and Snowboard Festival (WSSF). Expect tons of spring skiing; a full itinerary of events, contests, and shows; and more parties than any single human can handle. See the amazing MULTIPLICITY up close and personal, and check out the festival’s main attractions — the Olympus Pro Photographer Showdown and the 72 Hour Filmmaker Showdown. Have you ever sabered a bottle of champagne? Have you ever taken shots from a bar made entirely of ice? Have you ever consumed $1,000 worth of food and drink in one sitting? That’s what I thought. The contest is on until March 1st, 2015, so tell all your friends from near and far. Our fingers are crossed for you, good luck!